US Equity markets dropped slightly in abbreviated trading last week, as increasing political concerns around the healthcare sector amid growing "free Medicare-for-all" calls overshadowed a positive start to corporate earnings season. The S&P 500 dipped 0.1% for the week to bring year-to-date gains to 15.9%. The Nasdaq rose 0.2% for the week and is now up 20.5% for the year, while the Russell 2000 (small-cap stocks) fell 1.2% for the week to lower its gains for the year to 16.1%. 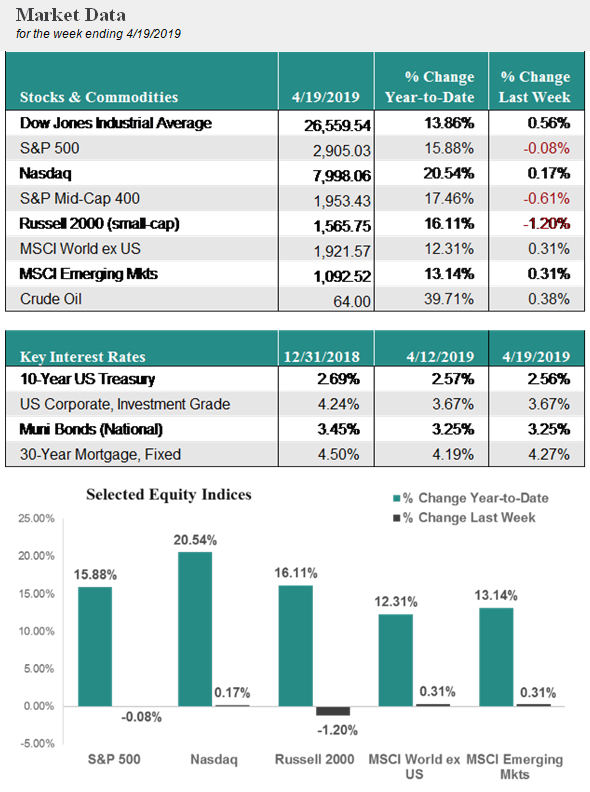 Global equity markets increased slightly last week thanks to encouraging economic data out of China and continued hopes for fiscal stimulus in Europe. Developed Markets increased 0.3% for the week, increasing its gains for the year to 12.3%. Emerging Markets also rose 0.3% for the week to brings its gains for the year to 13.1%. Earnings reports for the first quarter of 2019 began last week, and the initial reports have come in better than expected. With about 15% of companies reporting, roughly 78% have beaten earnings expectations and 53% have beaten sales expectations, with notably positive reports coming from the Industrial sector. After dipping in December and January, Retail Sales have begun to accelerate again, with March sales posting 1.6% growth, the best level that the US has seen since September 2017. The combination of strong first quarter earnings reports from the Industrial sector thus far and strong Retail Sales gives us increasing confidence about the health of the US economy.